Q I want my fringe like this one, very heavy across my forehead from one side, but whenever I do that the hair just falls down into my eyes, it won’t stay across my forehead like the girl in the pictures. At the moment my fringe is quite short, and it’ll barely go to the side at all! Please help, with how to style it or how to cut it or anything! A First off you will need to grow your fringe to around cheek bone level, this will add extra weight to your fringe (which will help keep it to one side). 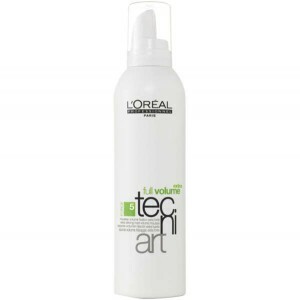 After shampooing I would place some mouse onto your hair and fringe, I would recommend using L’Oreal Professionnel Tecni Art Volume + Extra, it’s volumising and also thermal protective, it accelerates blow-drying whilst delivering a super strong hold, (this helps to keep your fringe to one side), use around a golf ball size just for your fringe but if your hair is very fine then a little less. Comb your parting into place then with a hairdryer on full blast hold it to the side of your parting blowing the hair away and with your other hand lift the hair slightly upwards which will help set the hair off your face. Once your fringe is dry spray some hairspray all over for around 4-5 seconds then repeat the same procedure with the hairdryer until completely dry. If after all of this your hair still decides to fall a little onto your face (which is doubtful but not impossible) this would normally be the last piece of hair directly over the fringe, pick up this piece of hair and gently backcomb the last inch from the roots on the underneath section, so any matting that you would get from the backcombing would hide when you put your hair back into place. This styling technique will help keep your fringe to one side. The thing to remember is everyone’s hair is different so you will need to play around with the amount of mouse and hairspray that you use, practise makes perfect as they say.